One of the northeast regions top cross-country meets just got even better. 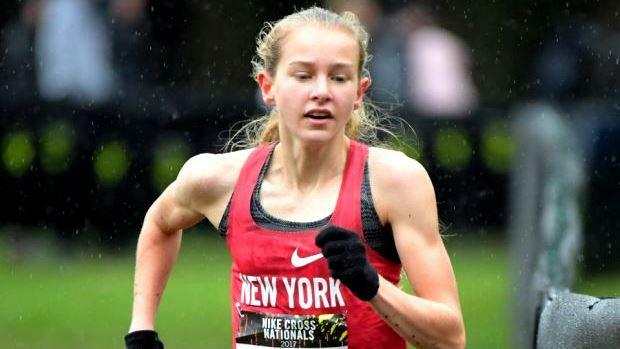 According to Bob Rothenberg, co-race director of the Ocean State Invitational (Sept. 21-22), last year's Nike Cross Nationals (NXN) champion and the country's No. 1 runner Katelyn Tuohy is entered in next month's meet, held at Goddard State Park in Warwick, R.I. Touhy will join her North Rockland (NY) teammates in the featured Championship race, which is among 14 high-school races that are scheduled for Saturday, Sept. 22. Rothenberg also told MileSplit RI that right now he has an email confirmation from fellow New York rival Saratoga Springs. At the 2017 meet, the Blue Streaks' Kelsey Chmiel set the current meet record of 17 minutes, 35 seconds for the five-kilometer course. Saratoga Springs also claimed the team crown. Tuohy and the potential of Chmiel in the race will be the first time that the two rivals will face each other on the trails since their 1-2 finish at NXN last December. Touhy is coming off a remarkable record-setting sophomore campaign where she established national marks in several events, including a U.S. national junior (under-20) 5K indoor record of 15:37.12. She also earned the Gatorade Female Athlete of the Year Award among other accolades. With the quality of the field and the meet's generous 3.1-mile layout, Touhy has potential to not only break the MR by Chmiel, but smash it! Locally, last year's R.I. state champion Portsmouth is one of the top school's entered.